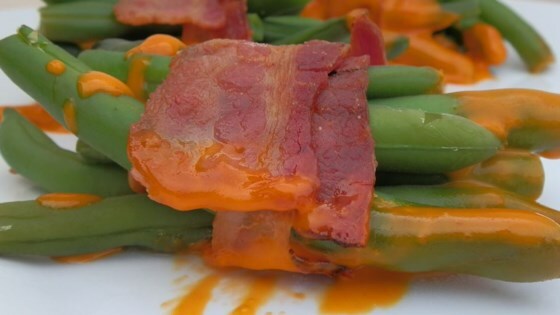 "Easy and impressive side dish made with green beans, bacon, and French dressing - great for a crowd. You'll need a few toothpicks to carry this recipe off right!" Slice bacon in half (easiest to slice whole package at once right down the middle). Bundle 6 to 7 green beans together and wrap one slice of bacon around the middle of the bundle. Secure with a toothpick. Arrange bundles in one layer in a baking dish. Pour French dressing over all of the bundles - make sure to drizzle some on each bundle. Bake in a preheated 375 degrees F (190 degrees C) oven for 30 minutes or until the bacon is done. A shortcut recipe for green bean casserole you'll want to have. Boyfriend loved them... he hates vegetables so by soaking them in dressing and wrapping pork around it, he was thrilled. For someone who likes fresh food, it was serious overkill on the flavors. My mother-in law makes these and they are always a holiday favorite. She does use Catalina Dressing and recomends letting them sit for a least 4 hours before cooking. I made these for thanksgiving this year. They were a crowd pleaser! Everyone remarked that they hope I make them again soon. I didn't have any dressing, but this was really good without. Great idea. Everyone loved them! This was VERY easy to make, and it tasted pretty yummy. I plan on serving it from time to time at dinner parties. A wonderful presentation & flavor for the everyday green bean. Great for a dinner party & each guest feels special to receive her own little bundle.